As mentioned in my earlier post of Three Billboards Outside Ebbing, Missouri, while I was on my way for holiday with my wife, I had the chance to see few movies during the 7 hours flight. After watching such a heavy drama, I wanted to give my brain a break by watching a comedy movie. My wife was actually the one who chose this first and she told me it was very funny. So I went ahead and see this one. What was the movie all about? Let us find out, shall we? A Ultimate Fight Championship (UFC) boxer named Edison (Allen Ai Lun) was at the lowest of his career. He was trying to make his come back and fight against the current champion, Wu Liang who beat him 3 years before in the final. During the weigh-in, he was interviewed by various reporters, including a very well known sports reporter named Ma Xiao (Ma Li - Goodbye Mr. Loser) who was very harsh on him. Ma Xiao also happened to be the girlfriend of Wu Liang. As fate would have it, Edison and Ma Xiao somehow had their body switched after an accident. This would be the start of the various hilarious moments when they tried many ways to return to their original body. Problems became bigger as they were unable to convince the people closest to them including Wu Liang, and Edison's manager/promoter Ma Dong. Since their lives must go on, while they tried to look for ways to switch back, Edison had to adjust himself inside a woman's body and vice versa for Ma Xiao. The biggest challenge for them would be pretending to be one another during their day to day routines at Ma Xiao's work and Edison's fights. So could they finally return back to their own body? How would the story ends for these two people who could not stand each other? All would be revealed when you complete watching the movie. This movie was truly very hilarious. There were many scenes that I thought were funny, or at least found myself grinning at those fun moments. The most funny scenes to my opinion would be the earlier part when they realized their body were switched. Both Allen Ai and Ma Li were so good in portraying the other character. They were very convincing as Allen would be so feminine while Ma Li would be so masculine, not to mention the scenes where Edison was utilizing Ma Li's body to enjoy things he could not do as a man. A body switching comedy movie would not be successful if the actor/actress could not perform their parts convincingly, and these two were able to pull it off. Apart from the performances from these two, there was actually another character that added the hilarious scenes i.e Master Zhang (played by Chinese comedian Teng Shen - Goodbye Mr. Loser, Mission Milano etc). There was one exceptionally funny scene which involved him towards the end of the movie. As for the rest of the cast, I think they gave decent performances but not as memorable as the first three. Oh before I forgot, the movie had few funny end credit scenes, so be sure to watch the movie till completion so you do not miss it. One thing that people might not like would be the comedy here was not the smart jokes from conversations, but rather from the physical appearances/attributes of the main characters. My wife and I were able to enjoy the humor and we were pretty entertained (my wife was particularly having a great time watching it as I could hear her giggling throughout the movie). As a comedy movie with few touches of drama & romance, this movie was able to resonate with the Chinese audience. To my understanding from the various news involving the film, I found out that it was the 9th highest grossing film in China till date (no. 7 if you only count Chinese movies) with total box office of around USD 334 million. Not a bad performance for a movie with budget of only around USD 10 million. 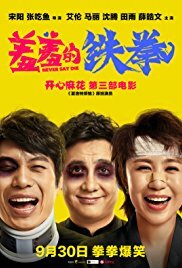 Anyway, if you are a fan of Chinese comedy movies you would certainly be able to enjoy this one. I think it was a bit similar to the 90s comedies from Stephen Chow. And if you like body switching comedy movie like Freaky Friday, then this one could be an option (of course with different level of humor). The choice is yours. PS: This movie did not play in Indonesian cinemas, and I think the most likely way would be to wait till it plays in Chinese movie channel on cable TV, or watch it through online streaming.